not what my original idea was, now i am forced to think i like more what it evolved into than what it could have been. how useful is ones own personal sun in a graveyard at night? better than that huge sword being carried by her friend i assume. next time, remind me to reduce the bust size of her friend. 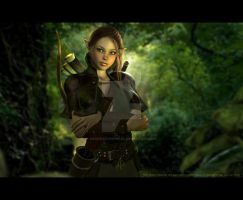 she would look much better if she was no more than a b.
daz3d instead of p6 this time. wanted to work with it's renderer. Nice fireball effect here. Looks really good. thank you, that was kind of a bit surprising for me how it turned out. it almost makes me wish i had just focused on her and the fireball instead of the whole thing. I can understand that, I had a similar thing happen but in reverse, I wish I hadn't put the attempted fireball in the final image. It just so didn't work.